The Nvidia GTX 1070 Ti surprises and impresses us with performance numbers almost parallel with the Nvidia GTX 1080 at an entirely reasonable price. Just when we thought Nvidia was out of new graphics cards to introduce, we’ve gotten a late-year surprise in the form of the GeForce GTX 1070 Ti. 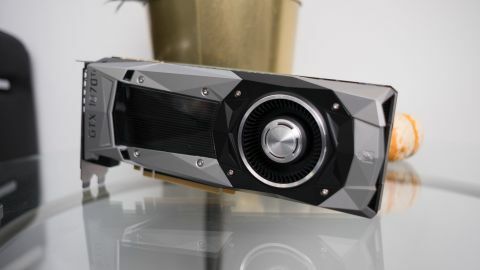 As with previous Ti cards, Nvidia’s latest GPU adds more CUDA cores and higher-frequency performance to improve upon the already-spectacular GeForce GTX 1070. While we’ve previously seen Ti versions of cards, like the GTX 1080 Ti, GTX 1050 Ti and GTX 960 Ti, this is a first for the company’s former mid-range card. Nvidia has slowly elevated the status of its x70 card from the celebrated mid-range GTX 670 to the high-end prominence the GTX 1070 knows today, and so it was inevitable we would see a Ti version of it too. The $449 (£419, AU$759) Nvidia GTX 1070 Ti Founders Edition neatly fills the giant price chasm between the Founders Edition versions of its $399 (£379, AU$699) Nvidia GTX 1070 and $549 (£529, AU$925) Nvidia GTX 1080. Aside from smart positioning on the component maker’s part, this GPU is simply a combination of those two cards. It packs in the available video memory and boost clock speed of the GTX 1070 mixed with the CUDA core count and base frequency of the GTX 1080. The only thing that the 1070 Ti feels like it’s missing is higher-end memory, like the GDDR5X 11Gbps modules, which are still exclusive to the Nvidia’s three highest-end graphics cards. Ultimately, it’s a much more approachable high-end GPU than stepping right up to the lofty cost of an Nvidia GTX 1080. What’s more, the Nvidia GTX 1070 Ti performs nearly as well as its older sibling – but more on that soon enough. For those reasons we would consider it no coincidence the Nvidia GTX 1070 Ti is also more affordable than AMD’s most powerful graphics card, the $469 (£419, AU$699) Radeon RX Vega 64. The Nvidia GTX 1070 Ti is the spitting image of its predecessor – or practically any graphics card since the company first introduced its Founders Edition redesign. Not that we’re complaining. Nvidia’s prismatic GPU frame is still fresh even though this is the fifth card to don it. Aesthetics aside, Nvidia has tuned up a few other elements under the hood. This GPU borrows the same 5-phase dual-FET power supply from the GeForce GTX 1080, thus bringing up the TDP of this card to 180 Watts. To offset this power boost, the GTX 1070 Ti also features an improved copper vapor chamber that helps it keep a cool head while overclocking. Unsurprisingly, the Nvidia GTX 1070 Ti pulls well ahead of the GTX 1070, but it was amazing to see how locked in step it is with the GTX 1080. While our synthetic tests show a noticeable gap between the two, looking at the frame rates in games reveals a graphics card that performs nearly as well as a part that costs a lot more. Stacked up against the AMD Radeon RX Vega 64, the Nvidia GTX 1070 puts up a good fight in the synthetic tests but it just doesn’t have enough compute units to keep up. Whereas we considered the GTX 1070 to have strong 1440p performance, the Ti version of the same card has mastered gaming at QHD resolutions. We have frame rates solidly above 60 fps in all of our test games with the exception of Total War: Warhammer II. However, none of the graphics card in our sample group were able to achieve more than 46 frames per second (fps) in our testing. While great for overclocking, moving up the 180-Watt TDP class comes with the unfortunate effect of higher energy draw. In our testing, the Nvidia GTX 1070 Ti is just as power hungry as the Nvidia GTX 1080 – and, in some cases, even more so. Similarly, the GTX 1080 Ti reaches only slightly higher temperatures than its older self, though, 77 degrees Celsius is still well within the safe operating zone of the Pascal architecture. If you’ve been hanging back with an old graphics card or a lower-tier GPU, the Nvidia GTX 1070 Ti is the perfect card to modernize your gaming PC with. It’s not nearly as expensive as the Nvidia GTX 1080 while offering nearly the same level of performance. And, best of all, it’s only a tiny bit pricier than the regular Nvidia GTX 1070.